Army Chief Gen Bipin Rawat reviewed the security situation along the Line of Control and the hinterland in Jammu and Kashmir. 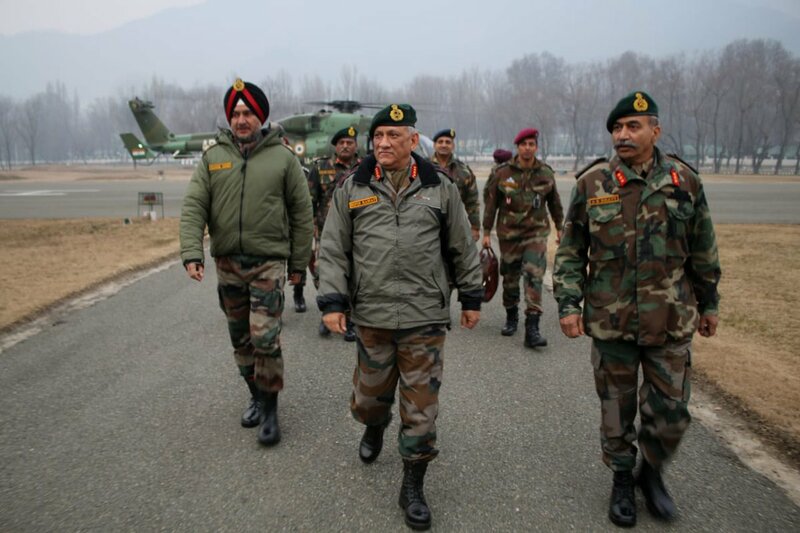 Gen Rawat, accompanied by Northern Army Commander Lt Gen Ranbir Singh and Chinar Corps Commander Lt Gen AK Bhatt, visited the frontier district of Kupwara yesterday. Chief of Army Staff, Gen Bipin Rawat visited Kupwara sector, today; Reviewed operational preparedness & security situation. Army Chief was briefed about the recent counter-infiltration operations. Gen Rawat interacted with the troops and spent the first day of 2019 with troops in the Kashmir Valley. Army spokesperson said, Gen Rawat was appreciative of the sharp vigil and ness along the Line of Control and high morale of the troops, and further exhorted them to remain for any eventuality. Army Chief also interacted with senior police officials and discussed the prevailing internal security situation in the valley. Gen Rawat also appreciated the seamless cooperation and synergy being maintained among all the agencies. Army Chief arrived in Kashmir valley yesterday on a two-day visit to the state.